First off, I need to give credit where due. I learned about this setup from Rick of www.naturalfarmfeed.com . They cost about $35. They come with a 3 year warranty. The great thing about them (other than the warranty) is that they can float or sink. 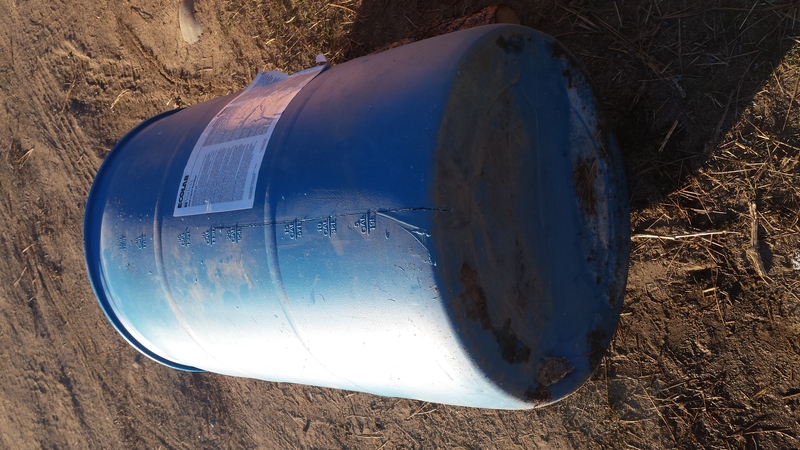 I buy at North 40 stores/Big R.
For the tank, I use the blue plastic 55 gallon drums. They cost me $20 a piece. I’m going to use a handsaw and a drill just to show how easy this is, but I recommend something like an angle grinder with a cutting wheel to cut. I’m going to do two barrels. The first is going to be for some experiments, so the bungs (the barrel holes) will be on the side I cut. Most of you will want the bungs on the back of the waterer (fence side). You’ll need to mark the barrel for cutting. The cuts need to be made so that the bungs are at the top and bottom. 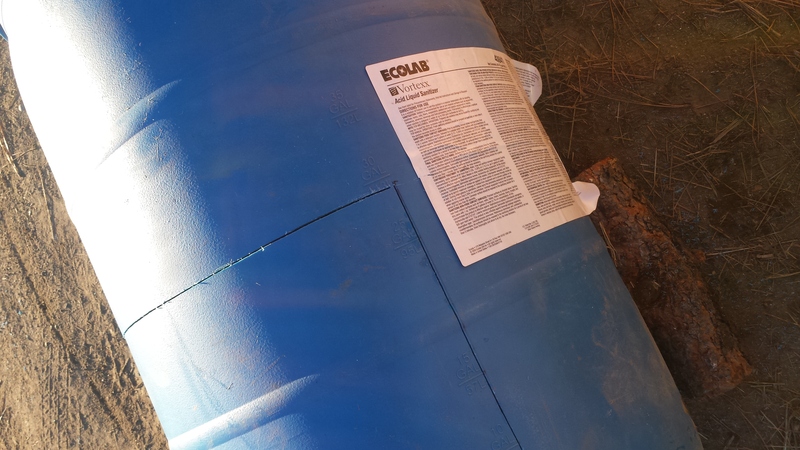 You want it this way so that you can use the bottom bung as a drain to rinse the waterer out. I use angle iron as a straight edge. More about this later. Align your straight edge so that it’s perpendicular to the bungs. Mark the sides of the barrel. Lay the barrel on its side. Draw cutting lines. As you can see, my straight edge is too short to reach the bottom of the barrel. If I want to use the bottom as the cut side, I’ll have to make a couple reference marks and then slide the straight edge farther down the bottom of the barrel, aligned with the marks. Notice how the straight edge “likes” to sit on the curve of the barrel? It helps make lines that go along the barrel’s axis. Start a cut on the line and cut into the bottom of the barrel just a bit (or the top if you want the bungs in front). Cut your way along the line you made, going up the barrel. I chose to stop halfway up. 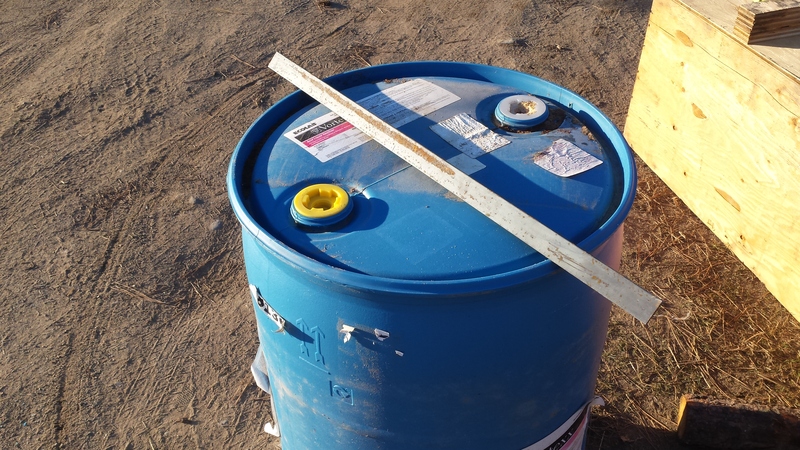 You can decide how much of an opening you want on your waterer by adjusting this distance. Make a cut across the side of the barrel. I try not to connect the cuts at this point, but get really close. Flip the barrel upside down. Draw a line from the cuts you made earlier. Cut along the line. Rinse your barrel well. 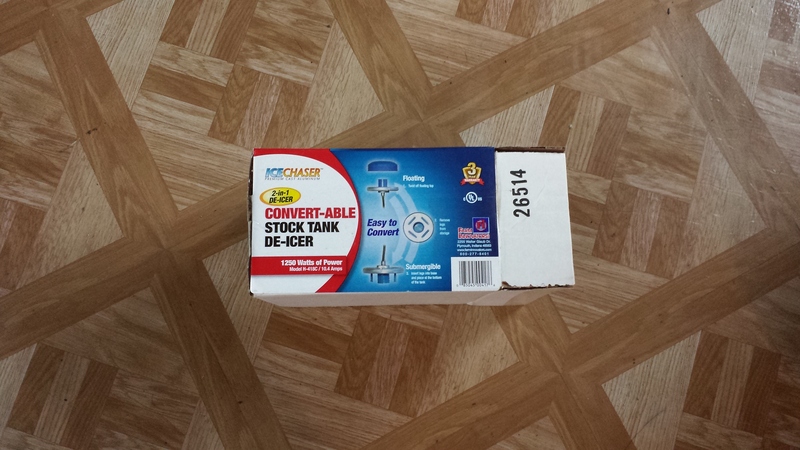 The barrels that I purchased contained soap originally. It should be easy to get them clean. 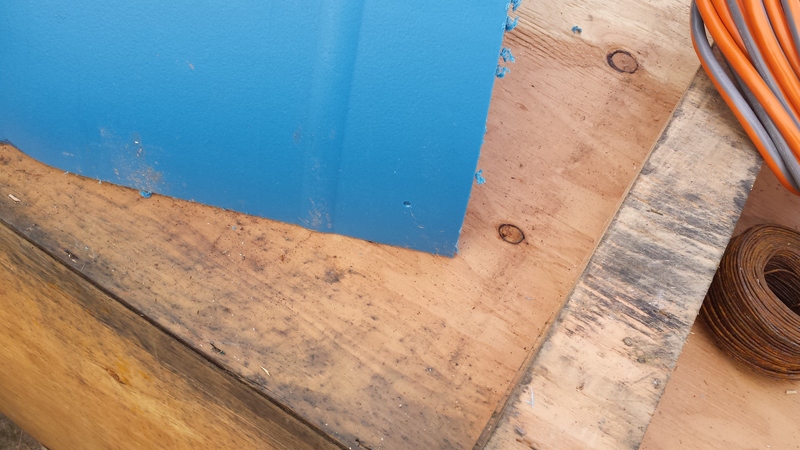 Take the top bung out or drill a hole at the top part on the back of the waterer. 1 1/4″ is about the smallest size a plug end will go through. Pull the power cord through the hole. 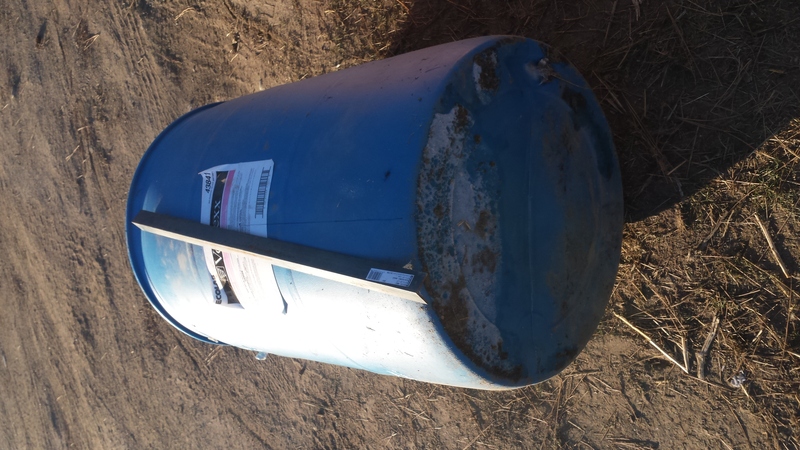 If the bungs are on the back of your waterer, all you have to do is slide the cut piece on the barrel like below and screw it in place. Otherwise, skip the next steps because we have to put some holes in the cut piece. Put a couple holes through the lip that runs around the back of the waterer, one on one side and one on the other. String some baling wire through them. You’ll use the wire to connect the waterer to your fence to keep it from rolling. It’s kind of hard to see, but the wires are holding the waterer to the fence. I’ll probably move the hot wire, running it above the waterer. 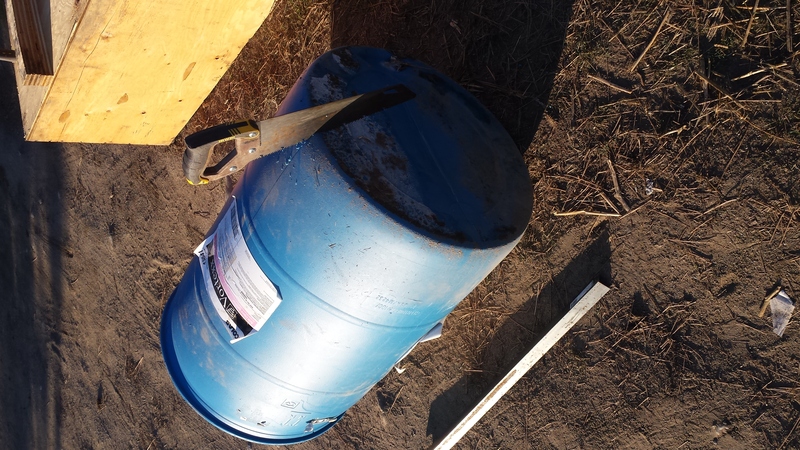 If you cut the bung end of your barrel, you’ll need to put some holes in the lid. 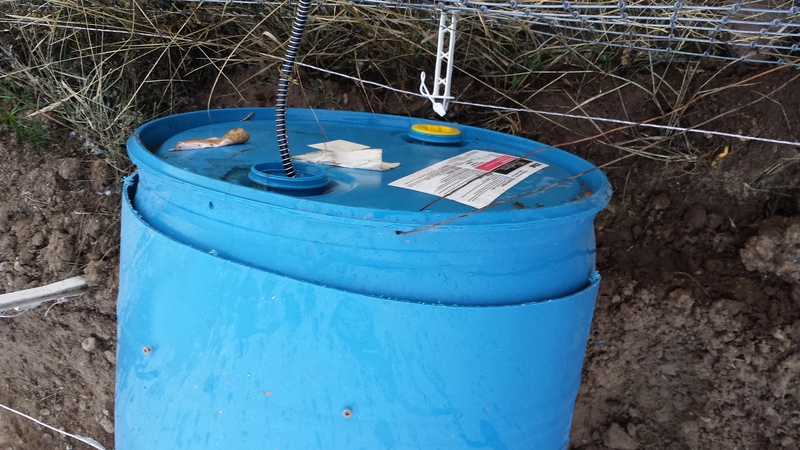 You’ll wire the holes to tie the waterer to the fence. If you don’t have a drill bit, make the hole with the screw. Back the screw out and keep pushing on it as you run your drill backwards. This will wallow (waller) out the hole. Yes, it’s hard on the drill but my batteries die before my drill does anyway and it’s always cheaper to buy a new drill with a batter than to buy just the battery. 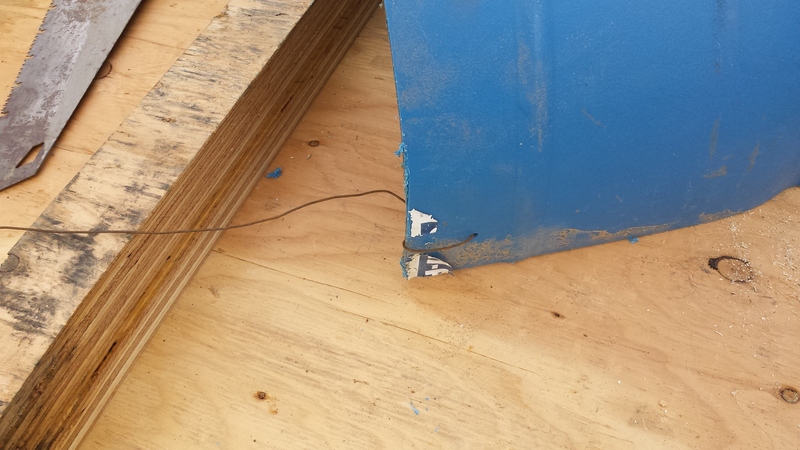 You can see the baling wire below. I like to put the wire twist on the inside so that the animals don’t scratch themselves on it. 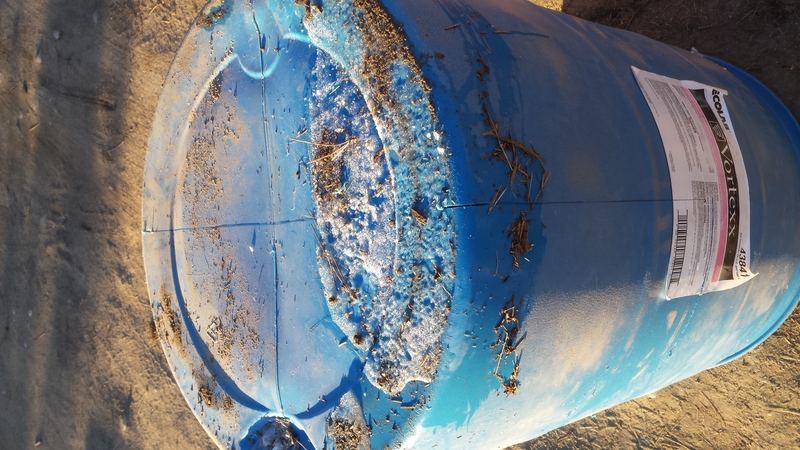 The lid on the waterer accomplishes several things. First, it keeps the animals separated from the heater. 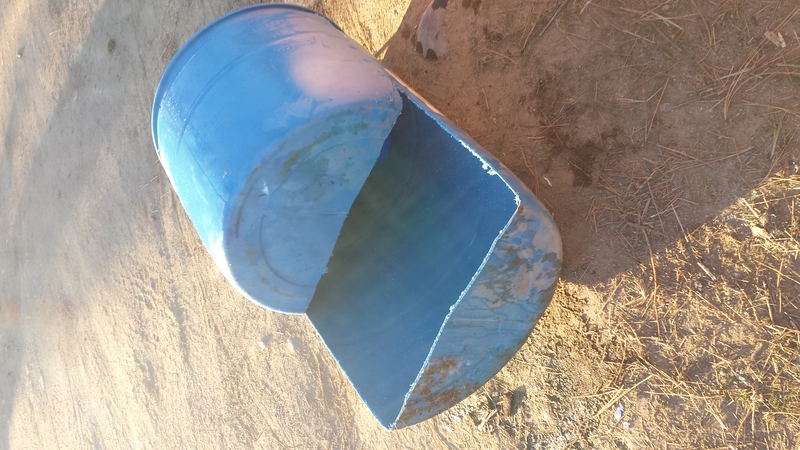 Second, you can adjust the lid so the animals can’t lay in the waterer, though pigs may still try. Third, the lid may hold a in a little bit of warmth, although I’m not too sure how effective it is. 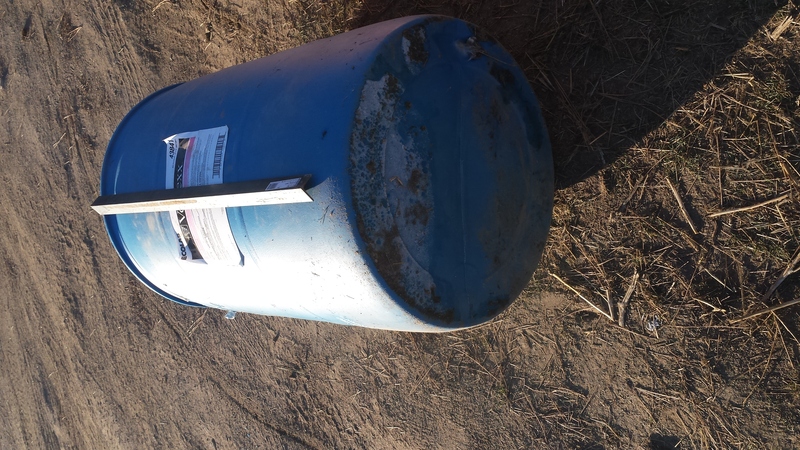 So, the barrel cost $20, the heater $35 and you’ll need an extension cord (3 prongs, preferably 12 gauge). How well do these work? 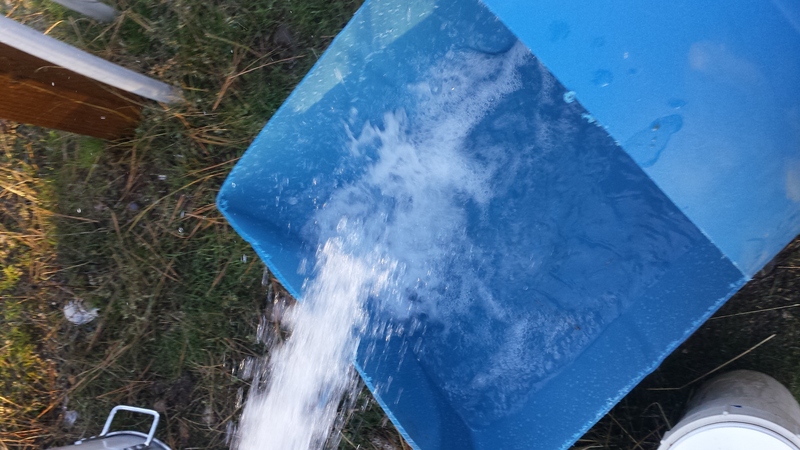 The other morning, I had a 1″ layer of ice on the waterer, but it was six degrees out. The pigs actually broke the ice themselves. Today, it was 12 degrees and there was just a bit of slushy ice at the top. This is a win. 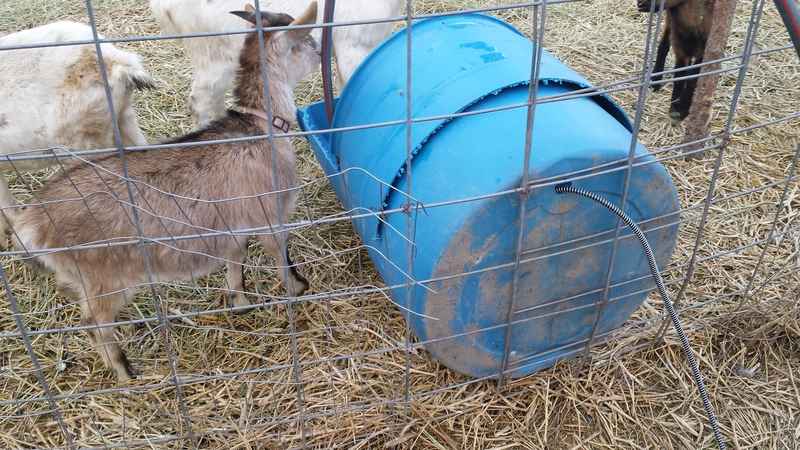 The waterer is too slick for my goats to climb. This is a good thing. 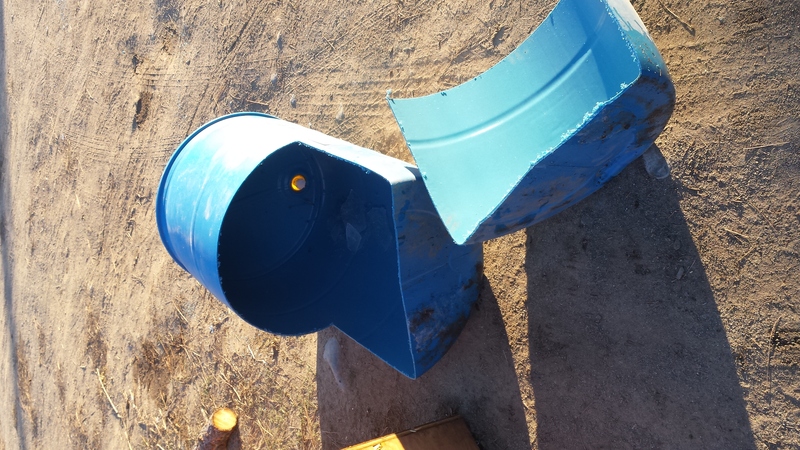 The pigs haven’t mauled the waterer in their pasture yet. I may build a 2×6 cradle to hold and protect theirs. Like I said, I’m really rushed, so holler if I forgot a step or two or wasn’t clear. Questions are always welcomed. Time for me to go pick up some more firewood. 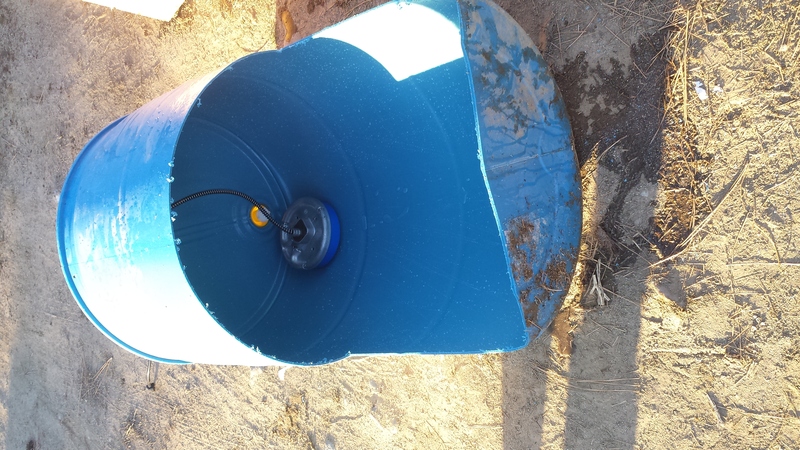 This entry was posted in Livestock, Poultry and Creatures Tame and Wild, Tools and Equipment and tagged goat waterer, heated waterer, pig waterer by admin. Bookmark the permalink. Thanks Jeremy, I’ve been looking for a solution for my pig watering problem. This looks like it.